BANGI, 15 October 2014 – The Department of Health Information at The National University of Malaysia Medical Centre (UKMMC), Distinguished Professor Datuk Dr Shamsul Amri Baharuddin and Prof Dr Mohamed Amin Embi were among the 70 recipients of the 2014 UKM Innovation Awards. They were bestowed the honours at a special ceremony here today. Most of them are academic and administrative staff, researchers as well as organizations, departments and centres. The Department of Health Information received the Vice Chancellor’s Award for Quality for excellence in operations and performance. It began as the Medical Record Unit in 1982 under the Faculty of Medicine, which was located at the Kuala Lumpur General Hospital. In 1997 the unit was upgraded to be a department and beginning January 1, 2010 it merged with the Case-Mix Unit and rebranded the Department of Health Information. Director and founder of the Institute of Ethnic Studies (KITA) Prof Shamsul Amri was bestowed the Citra Award as an individual who has attracted a lot of positive press coverage and made a major impact in enhancing UKM’s image in the mass media. He had dreams of becoming a pop singer in the late 1960s but is now a prominent figure as an academic in anthropology and sociology. Considered a “celebrity”, he has many fans because of his out-going personality, wit and charm. 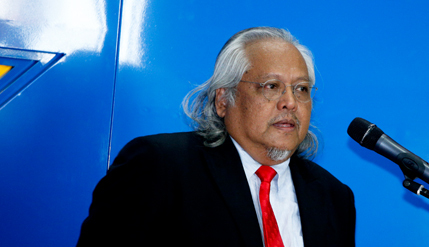 Although not everyone remembers his name, many will recognise Prof Shamsul Amri as the ‘long-haired professor of UKM’. Prof Mohamed Amin is director of the Centre for Academic Development. He is a leading figure in the field of e-learning and e-content in the region. Prof Amin has received more than 33 awards and medals for his innovations and contributions. Also honoured this year were the International Centre for Casemix and Clinical Coding (ITCC-UKM), Prof Dr Wickneswari Ratnam, Foziah Hanom Ahmad and Prof Dr Imran Ho Abdullah. ITCC was singled out because of its achievement in advancing solutions using innovative technology for the health care industry. Prof Wickneswari was honoured for implementing innovative research that brought a huge impact and returns to academic and commercial advancement. She researched red rice and boosted quality of the modern rice which is now recognized as a new variety. Foziah is Senior Assistant Registrar at the General Administration Department, UKMMC. She is proud that the department contributed to the successful implementation of the 5s’ at UKMMC and being awarded the certification audit of all 179 zones by the Malaysia Productivity Corporation (MPC) for the sixth consecutive year. Prof Imran received the award for his role in the success of the ‘2014 Malaysia to Mexico Mobility programme’ where students from Mexico joined the global mobility partnerships of UKM. Student Mobility is an education programme for undergraduates and post-graduate to experience student life in other countries. Among the other award recipients were Prof Dato’ Dr Mohd Yusof Hj Othman, who won first prize for coming out with his book on solar energy technology and photovoltaic-thermal cells, and Prof Dr Huda binti Abdullah who carried out research on nanotechnology.